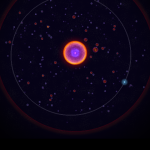 Plug in your headphones, sit back comfortably and relax – Osmos HD is a laid-back, soothing and brilliantly beautiful physics-based game for the patient. If you are the choleric by nature, Osmos might teach you how to relax, but my guess you will be twitching and jerking each time you fail. 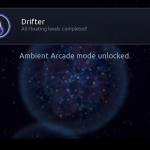 However, those seeking to relax and unwind with a great game and some nice ambient music will be able to fully appreciate this Darwinian survival quest. 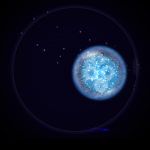 You are an amoeba – unique, blue and shiny. You can see tiny hair-like particles moving inside the cell – the work of light and color is truly remarkable. You are surrounded by the likes of you, but you can see you are different due to the unique heavenly color of your amoeba. Your opponents are of ominous orange-red glow. The environment is visibly motionless; everything stands still until the one who wants to explore and grow starts moving, and yes, it would be you. Tap next to your cell, and you will see it eject a tiny bulb of its mass, which propels it in the opposite direction. 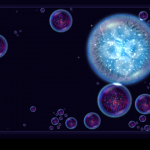 So, the physics I pretty simple – tap and the amoeba moves in the opposite direction. 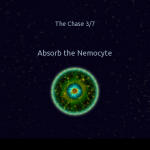 Your aim is to consume cells that are smaller than you, and avoid the ones that are bigger. 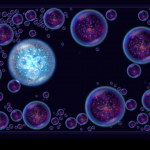 You grow bigger with each consumed cell, thus you can outgrow the biggest and consume them in the end. Don’t let the seeming simplicity of the introductory levels fool you. Soon enough, the game becomes increasingly difficult, and moving is not always the best solution. Sometimes, you just have to wait and see, while on other occasions the sooner you hunt down your prey, the more chances of survival you have in the end. 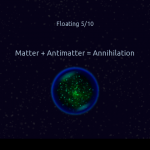 At some point, your environment gets filled with antimatter, so anyone colliding with it gets annihilated, or loses mass, depending on the ratio of the cell vs antimatter. The controls system is very neat here. 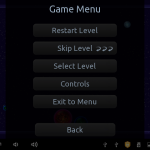 One-finger tap makes your buddy move; two-finger tap lets you restart the level; three-finger tap takes you to the next level when you’ve completed the current one. You can swipe left or right to slow down or speed up the time, and sometimes it helps you beat the level. 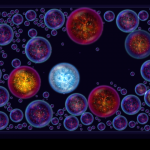 Osmos HD is a visual delight, and a true treat to your senses. It is HD, indeed, and looks fantastic even on middle-range devices. It won’t make your eyes hurt, nor will you dream of special effects when you close your eyes, as is the case with frantic games like Smash Hit or Unpossible. 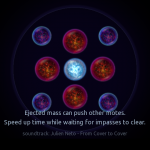 On the contrary, Osmos is about chilling and letting go, focusing completely on the smooth, slo-mo action and enjoying. The game mixes wonderful gameplay with great finesse and style, and by now it has become the classics of the genre, still unrivaled. 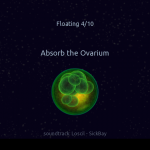 The sound score for Osmos consists of many fine ambient tracks, somewhat minimalist, yet elegant, so it’s best enjoyed with headphones. Overall, I wouldn’t say you could enjoy it while commuting, even though I am sure many gamers do that. However, it’s a purely atmospheric experience that is best enjoyed in the comfort of one’s couch. 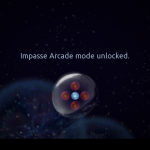 The game features 72 levels and 8 different level types – ambient, solar, antimatter, impasse, repulsor, sentient, warped chaos and epicycles. It’s a polished puzzle, unique and atmospheric, so you can apply both strategy and logic, but also relax and let it flow. It is both fun and at times unnervingly difficult, yet it keeps you coming back for more even when you are through with all the levels. 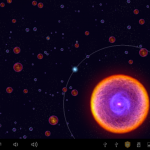 Osmos is available as Android, iOS and Windows desktop game, but whichever you choose, you cannot go wrong with it – it’s unlike anything you’ve played before, and I believe I am exceeding my limit of adjectives per review – it’s fascinating. 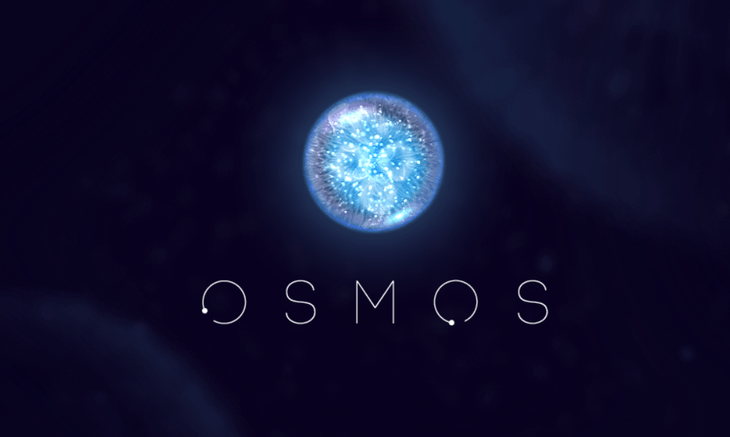 I seldom play in multiplayer mode, but it’s worth mentioning Osmos added it and now you can play locally via WiFi of via Google Play Services. 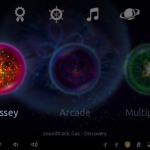 Osmos HD isn’t just a beautiful arcade game – it’s fascinating, dazzling and elegant. Surreal visuals paired with mesmerizing electronic soundtrack make it a unique experience very well worth its money. You can’t go wrong with Osmos, get it. 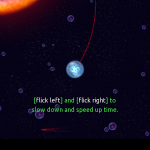 Osmos HD will engage you for long periods of time and keep you coming back for more. It's addictive and challenging, but also a perfect ambient chillout experience, atmospheric and engrossing. Very enjoyable and rewarding, it makes you feel good without any pressure on your sight or nervous system.